“Lemongrass might help prevent the growth of some bacteria and yeast. Lemongrass also contains substances that are thought to relieve pain and swelling, reduce fever, improve levels of sugar and cholesterol in the blood, stimulate the uterus and menstrual flow, and have antioxidant properties” (click here for source). Nutritionally, lemongrass also offers vitamins A and C, much of the B complex, as well as folate. It also contains many essential minerals. One of my favorite ways to use lemongrass is in tea. I cut about 3-4 inches off the bulb end 0f 3-4 lemongrass stalks, crush the stalks and bulb with the flat end of a knife (or meat pounder) and place them in a pan with a 3-4 cups of water. I heat just under boiling (in order to preserve the properties of the precious oil), and then let it steep for about an hour. The tea can then be consumed cold or reheated (just don’t boil it). 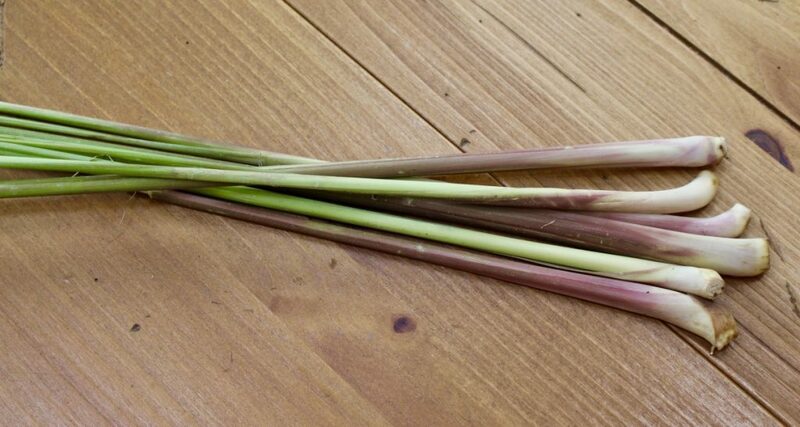 lemongrass is also used in many Southeast Asian dishes such as soups, sauces, meat dishes etc… The stalk is constructed in many woody layers, with a very aromatic and flavorful soft inner core layer. Typically, only the soft inner part of the stalk is used for cooking, mainly because the outer stalk is tough and hard to eat. The lemongrass we will be receiving from the farm is quite narrow so the soft inner stalk will be very small. Rather than try to free the little bit of tender stalk in the middle, I suggest first removing at least the first outer layer of stalk. Then cut about 3″ off the bulb end and either very finely mince it or puree it in a food processor with some garlic and ginger to make a paste for curries. You can also use large pieces of the stalk in soups. Using the side of a knife or meat pounder, crush the stalk to break it open. This releases all the flavor and oils. Place the crushed stalk in the soup and then discard it after the dish has cooked. I love to make my own homemade vegetable broth from bits and ends of CSA produce I would otherwise throw away. I will include my method for making this broth below. What I wish to say here is that I sometimes add crushed lemongrass and ginger to the veggie broth pot. This makes a ready Asian flavored broth that I can freeze and later use for any kind of Asian meal, like a quick Asian chicken soup which I love to have when I come down with a cold. I post this technique every year, typically in the fall when the cooler nights invite warming soups and stews. This technique of using your CSA scraps to make vegetable or meat broth is a brilliant way to save money by using almost every scrap of your CSA share. It also allows you to avoid buying processed broth, which often contains questionable added ingredients such as sugar and MSG. Plus, a broth made with such a wide CSA variety of veggie scraps just has to be chock full of vitamins and minerals. You can also control the amount of sodium in your broth by making it yourself. I strongly encourage you to try this method. It is simple and, frankly, much better tasting than commercially made broth. I initially learned this method from a blog that introduced me to using a crockpot for making veggie broth while I slept at night. http://www.goodforgreen.blogspot.com/2009/03/crockpot-vegetable-stock.html. Simply save most vegetable scraps meant for the garbage or compost pile in a large re-sealable plastic baggie stored in the freezer. Add to it as you cook. When the baggie is full, dump it in the Crockpot and add enough water to cover. Add a few peppercorns and/or a small amount of herbs (like thyme or parsley) or dried herbs tied in cheesecloth. Turn on low and cook for 6-12 hours. Sieve out solids (use them now for compost), let broth cool, then portion and freeze, or use within 4 days. Non-waxy and non-bitter scraps work best and can also include onion skins (great for color), garlic and garlic skin, bell pepper scraps (avoid seeds), Kohlrabi stems, stems from greens (beware of beet and red chard stems which may color the broth), zucchini and summer squash ends, tomato ends/seeds/pulp, carrot ends and peels, asparagus or green bean ends, choi stems and greens, cauliflower leaves and cores, Kohlrabi peels and ends, mushroom stems, and broccoli stems. Sparingly use strongly flavored vegetables such as broccoli, cauliflower and cabbage as they can overpower the taste. Avoid waxy vegetables (cucumbers), bitter seeds and pits, and beet scraps. Potato skins can add a starchy element, so I tend not to use them. Just remember to get in the habit of washing all vegetables (even the onions) before you peel or de-stem them if you are planning to use them in the broth. You don’t want any sand or dirt in your broth!! Vegetable broth can also be made in a regular pot on the stovetop and only takes 1- 1½ hours to cook. Make broth regularly throughout the CSA season, or if you are too busy, freeze the baggies of vegetables scraps to use later. The scraps will last about 6 months in the freezer. You can add bones to the broth to make your desired meat/bone broth. Raw or cooked bones (as in leftover cooked chicken carcasses) work equally as well. I also often add uncooked chicken necks or wings for added flavor. For a make-your-own seafood broth, add in shrimp shells, lobster shells, and/or fish bones. For a rich beef, lamb or pork broth, roast your bones in a 350 degree oven prior to adding them to the stockpot to get a good caramelized flavor. When making bone broths, add 1 tablespoon apple cider vinegar to the broth to help release the nutrients form the bones. Bone broths should cook for 24 hours to derive the most nutrients, particularly the healing gelatin and collagen. Gelatin and collagen offer significant benefits for gut and joint health. Don’t be surprised if your cooled bone broth broth gels up. It will “melt” upon reheating. This will easily become a habit. Try it!! 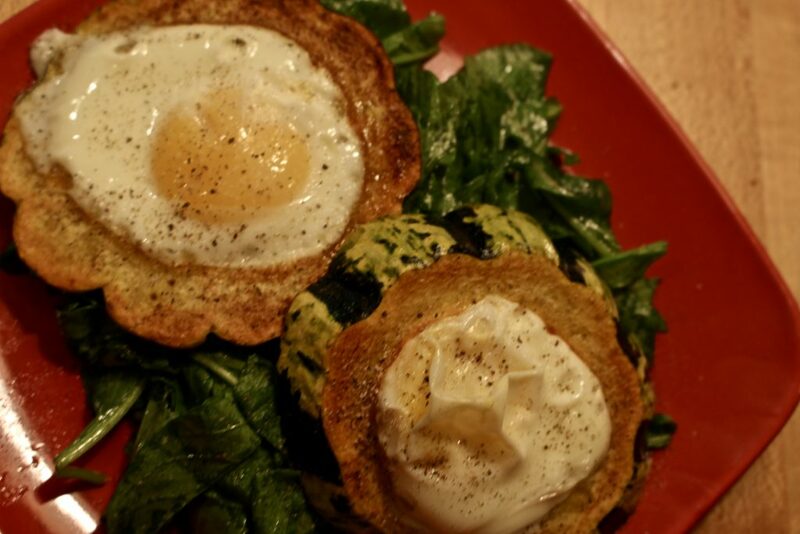 Below is a fun way to use carnival (and maybe even large delicata) squash for breakfast. Toad in the Hole is usually a dish in which an egg is cracked open and cooked inside a piece of toast with a hole cut out of the middle. Here I am using the hollow center of certain squash to make a quick, one pan toad in the hole that I serve over zesty dressed arugula. This dish is great for either breakfast or lunch. Preheat oven to 350℉. Rub or brush 1 tablespoon olive or avocado oil evenly on rimmed baking sheet. Trim ends of squash. Cut squash into 4 equal rings (about ⅓-1/2” each). Remove loose pulp and seeds from the center of each ring. Place rings on baking sheet. Turn over once or twice to coat in oil and find the side that sits most flat on the surface of the pan. Once you have found the side the sits the flattest, turn over the ring to the opposite side. Sprinkle with salt and pepper. Place in oven and bake for 10 minutes. Remove from oven and turn squash pieces over to their flattest side. Carefully break an egg into the center of each ring. Season with salt and pepper. Carefully return the pan back to the oven and bake an additional 8-10 minutes or until the egg is done to your liking. Remove pan from oven. Meanwhile, toss arugula in a medium bowl with two teaspoons extra virgin olive oil (or avocado oil) and two teaspoons white wine vinegar until well coated. Season to taste with salt and pepper and toss well. Divide arugula between two plates. Using a thin spatula, carefully lift each toad in the hole atop arugula. Serve immediately. As always, thank you for the fantastic info and tasty recipes. Question: I am reading the broth- making instructions from my phone – which could be part of the problem – but I am confused about the length of cooking time. Is it 6-12 hours or 1-11/2 hours? The time depends upon whether or not you are using a crockpot or a regular pot on the stovetop. Crockpot is 6-12 hours, stovetop is a minimum of 1 1/2 hours. I hope you try this. Once it becomes a habit, it is a really simple and inexpensive way to keep yourself stocked with broth.